The villa was built in 1995. Done in a luxury Portugees Style. The house is sophisticated and traditional but is still really comfy. 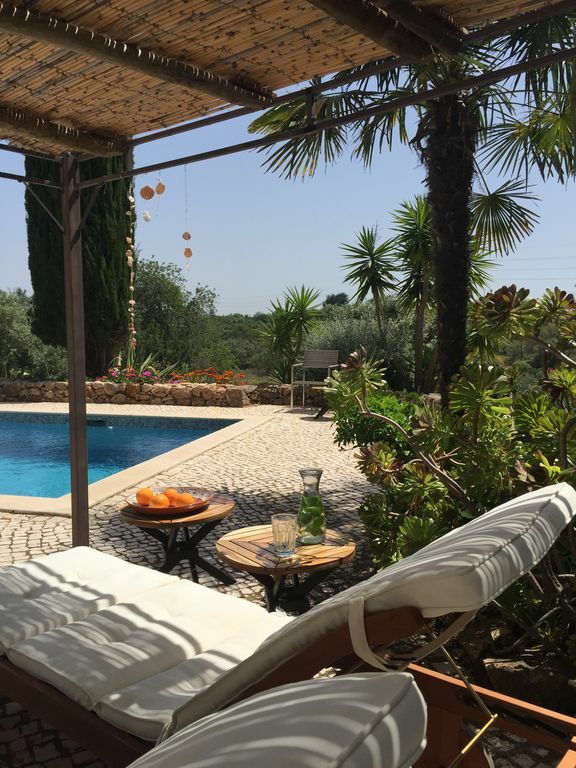 The authentic character of the building and the really quiet, rural surroundings give you an optimal feeling of experiencing a traditional Portugees holiday. The house exsists of a main building and an annex divided by a gate. The annex has it's own entrance. The main building exsists of a spacious living room, separate kitchen and 2 bedrooms with both 2 beds. One bedroom has an ensuite bathroom and there's an other seperate bathroom in the main building with a bathtube. The third bedroom is situated in the annex with two beds and an ensuite bathroom. All the three bedrooms have their own access to the terraces and the swimming pool. Besides that there's an outdoor kitchen with BBQ, second fridge, washing machine and connected to a big covered terrace. Every room is equiped with a big fan so you get a nice breeze during the hot summers. All the doors and windows have a screen to protect you from mosquitos. The house is just a small distance away from the masstourism in a rural and hilly area. Really quiet and peacefull. A couple of restaurants, bars, bakery, mini supermarket and the local trainstation (Poco Barreto) are just 2 miles away. The train runs straight to Faro and other directions. The monumental city of Silves is 4 miles away. Old, small alleys, cosy squares, supermarkets, many cafes and restaurants. The beaches: Armancao de Pera (6 miles), Praia da Marinha (8 miles) and Senora de Rocha (10 miles). The past years is the Beach Praia da Marinha been elected several times as one of the ten most beautiful beaches of Europe and one of the hundred most beautiful beaches in the world. Lisbon: 2,5 hours by bus from Silves. The airport of Faro is 30 miles away. The house has a 100% free view, south faced and has a big garden ( 3320 square meters) with lot of old trees and plants. There are several terraces, paved with beautiful old white boulders similar to those used in the historical centres of ancient Portugees cities. In one of the terrraces the private saltwaterpool is inbedded (8X4 meters) surrounded by palm trees, cipresses and a big diversity of subtropical vegetation. The Villa is tastefully decorated with a mixture of antique furniture and modern design. The kitchen is well equiped with a 4 jet stove and an electric oven, big fridge with a freezer, dishwasher, microwave and foodprocessor. The stove has a wokburner. The six beds have hotel standard (210X90 cm). The villa has it's own water supply. The filtered water can be used from all the tabs. No dragging around with water bottles. Behind the main gate there's a parking area. Directly from the house there are startingpoints for hiking and MTB trails. Wifi/TV/Audio are present. The house is childproof for little children. There is a baby chair, cuttlery and some games for in house and in the pool. Also there's a baby crib. Thank you very much for these kind words. We really appreciate you took your time to write this review. We're very happy you appreciate the house as much as you did after your first stay. Perhaps we will welcome you again in the future. De woning, de terassen, het zwembad en de prachtige grote tuin, dat moet je gezien hebben!!! We're very pleased with these kind and beautiful words. It makes us very happy when guestst are that enthousiastic about our place. Like you we enjoy our stays at the house very much. Sitting outside in the tropical garden and experiencing the silence and beauty of the abonded and wide open green valley is what holiday should be. Thanks for taking your time to write this review. We're honoured to recieve you again in 2019. At the end of August our family stayed for a week in the house. We really enjoyed the house and atmosphere in the garden. From the pool it seems that you are in an oasis. The nights are very quiet so we can sleep well. Further everything is there what you need. We have made a number of beautiful walks and a visited a few very beautiful beaches. Praia albandeira and Marinha were really stunning. There is a nice hiking trek over the cliffs. We will definitely come back again. What a lovely house, garden and surrounding. We really appreciate taking your time to write this lovely review. We feel honoured with your enthousiastic words. We're very happy with this quiet and peaceful spot. Swimming in the pool underneath the waving palms still feels for us like a great favour. We're very happy having found this place. Thank you again for your visit and of course we like to recieve you again in future. A lovely property in an excellent location. Nice and quiet with great views not far from Silves. Would definitely recommend to anyone. Would of liked the pool to be heated a little as a bit of a shock to the system in the heat of August. Evenings and night time sleeping could of been improved with air conditioning in some rooms. All in all though a fantastic property that I would be happy to call home! Thanks taking your time for this review. W're happy with your recommendation. About the temperature: the pool can be heated, but we don't do that in summer. The temperature of the water is about 26 degrees , which is an optimal temperature for refreshment. We traveled a lot ourselves and didn't get excited about airco: a lot of noise and it causes infection problems. So we prefer the propellor fans on the ceiling. Heerlijk huis, heerlijke tuin en zwembad. Heel goed contact gehad met eigenaars vooraf. Zalige week achter de rug. Een adresje om te onthouden!